We'll have a smaller curated selection of vendors with vinyl for sale, PLUS we're doing the open-turntables DJ slots again. This is five shopping days before Christmas and gift wrapping will be available. We'll also have a "record check" so that you don't have to carry your records around (if you want to shop and continue to hang out). We’re using the third floor (the green room, never used for an event before). That's where the records will be. Expect half a dozen or so vendors. The second floor will be where the open-turntable action and the drinks are. All open-turntable slots are already filled. 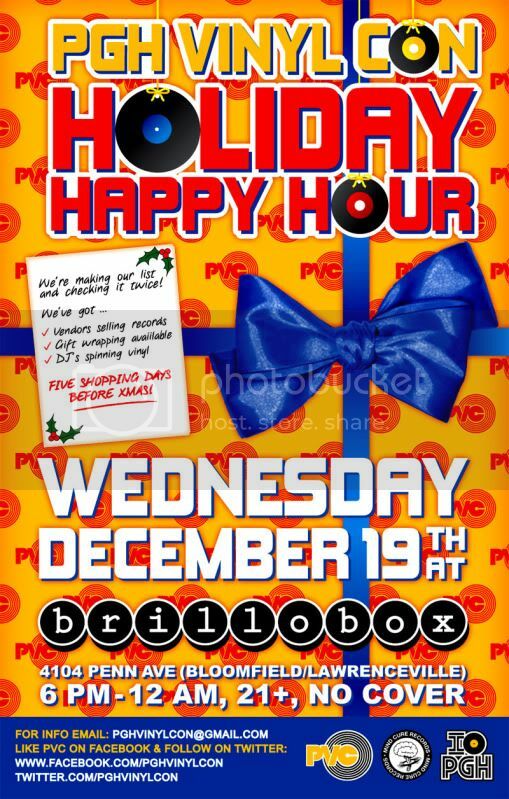 RSVP for Pgh Vinyl Con Holiday Happy Hour at brillobox to add comments!